Take the short water taxi ride to Shackelford Banks to see the Shackelford Banks ponies and go shell collecting. You’ll need to drive to Beaufort (45 minutes) from Emerald Isle. Operated by the Outer Banks Ferry Service located on the Beaufort waterfront at 326 Front Street, Beaufort, NC, I recommend you call 252-728-4129 for schedules and more information. 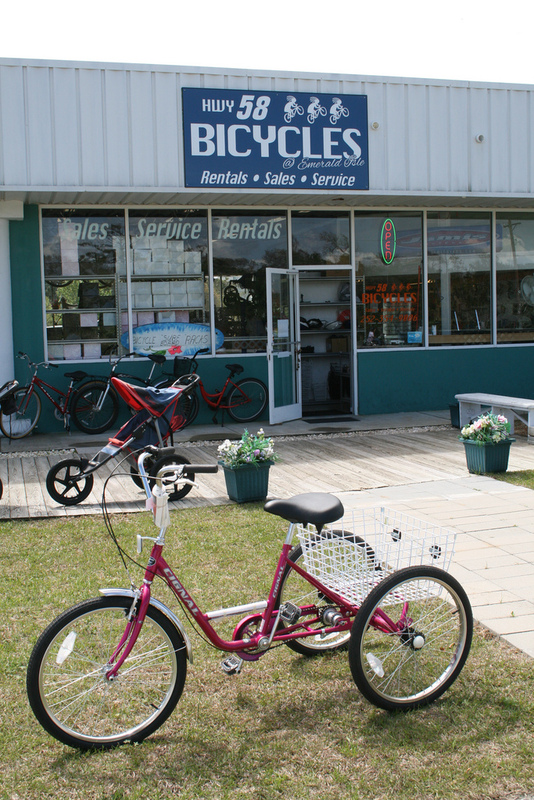 Rent bikes from Hwy 58 Bikes rentals in Emerald Isle. It’s so convenient, the shop is located right on the Emerald Isle bike path. Go bowling at Mac Daddy’s in Cape Carteret. This is the perfect rainy day family activity! Hit the waterslide in Emerald Isle. One of the oldest amusement parks on the Crystal Coast, the Water Boggan is located at the corner of Reed Drive and Islander Drive (less than a half a mile from the Emerald Isle Bridge). Visit Fort Macon on the east end of the island of Bogue Banks near Atlantic Beach. This North Carolina state park and civil war fort offers the public access to the surf, sun and sand of the Crystal Coast—as well as a historic landmark. Catch a movie at the Emerald Isle movie threater. For those rainy days, why not catch a movie at the Emerald Plantation Cinemas located at the Food Lion shopping in Emerald Isle. Phone (252) 354-7263 for list of movies and show times. Kayak to Bear Island ($55 per person) to Hammocks Beach State Park. A short drive over the Emerald Isle Bridge to the waterfront hamlet of Swansboro, here you can leasurely kayak to Bear Island. Rent jet skis at Water Sports Jetski Rentals (address: 1960 Salter Path Road Salter Path, NC 28575 Phone: (252) 247-7303) Bogue Sound is the perfect location to rent a jet ski or waverunner. Here your family can navigate the many islands that dot our Intracoastal Waterway while keeping a safe distance from larger boats. Visit the N.C. Aquarium at Pine Knoll Shores. Here you can have a close encounter with a stingray and even get eye to eye with a shark. 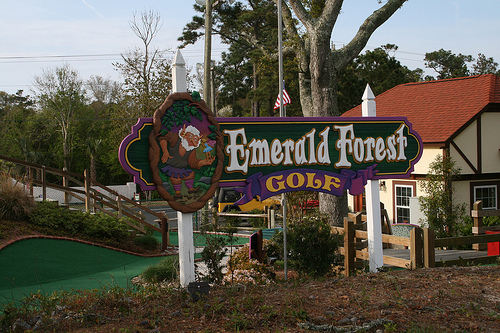 Perfect for those rainy days at the beach, this is one of the most popular attractions on the Crystal Coast. Located five (5) miles west of Atlantic Beach, take NC 58. Turn onto Pine Knoll Boulevard at the stoplight at Milepost 7. Turn left onto Roosevelt Drive. For N.C. Aquarium hours, it’s best to call 252-247-4003 or toll-free 866-294-3477 for a complete list of events and hours of operation. What’s Your Favorite Activity on the Crystal Coast? If you are a veteran Crystal Coast vacationer, please leave a comment and let everyone know what fun activity your family loves here on the Crystal Coast. When is the best time to visit the Crystal Coast? Hi Jay – Most would say their favorite times to visit the Crystal Coast is just before Memorial Day or right after Labor Day. The beaches are less crowded and the rental rates are much more affordable! Thanks for stopping by to comment! Where are the batting cages on Emerald Isle? Penny, the batting cages are located across from the waterslide just after you pass the first light from the bridge or you can cross the bridge over to Cape Carteret and checkout the batting cages next to Mac Daddy’s Bowling Center. I’m staying at Pebble Beach and was wondering how much it costs to rent a jet ski?? CanLo – Jet ski rental rates during the peak season are probably going to run you about $60-$75 an hour. If I were you I’d give the folks at Water Sports Jetski Rentals (address: 1960 Salter Path Road Salter Path, NC 28575) a call at (252) 247-7303. Great idea for a real estate blog post… people love writing about finding vacation bargains. Just a thought…our boat rentals (19′ Carolina Skiffs & 23′ Sweetwater Pontoons) offer an affordable way to see the sights in the area. Half & full day availability.